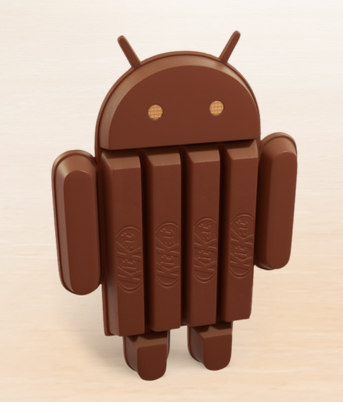 Google has just announced that the name of the next major version of Android will be known as 4.4 KitKat, with the mobile and online services king also announcing more than a billion devices running the Android platform have been activated. Google has already launched an official website for the new version of its mobile operating system, with the news on Google+. by Google’s senior vice president of Chrome and applications, Sundar Pichai, who took over management duties of the Android platform from Andy Rubin in March, also announced that the platform has seen over a billion device activations while hinting at new devices being unveiled at the IFA in Berlin. Since this next version of Android is only a point release and not a jump to version 5, Google could just be continuing its defragmentation of Android by offering it's killer apps and features as modular parts instead of being bundled into the OS. Android 4.3 saw the introduction of a more powerful Google Play Services framework, which most Google apps rely on currently, allowing the company to push updates to phones that are running versions of Android as old as 2.2.